With a lot of options for fin systems available, it’s becoming increasingly difficult to make a choice, possibly struggling to figure out why one is better than the other or what disadvantages they may have. This article is designed to introduce the basic fin systems we come across and outline the advantages and disadvantages. The systems can be split in to three basic categories – Fixed, removable post-glass and removable pre-glass. As this name suggests the fins are permanently fixed to the board (fibre-glassed on during board construction). This is the original fin system and is in somewhat regarded as outdated in modern surf culture. Stronger and better performance – Being fibreglassed to the board and often constructed completely from fibreglass , the fins are strong and stiff, which results in a positive feeling underfoot, with great flex and drive characteristics when surfing, which is well suited to bigger, more powerful waves. Difficult/expensive to repair and awkward to travel with – If you break a glass-on fin, it won’t be pretty. As the fins are laminated directly to the underside of the board in construction, often a large area of the board around the fin will also become damaged. It is a difficult and potentially expensive job to repair or replace a glass-on fin. It may be obvious, but you can’t change your fins if they are glass-ons. 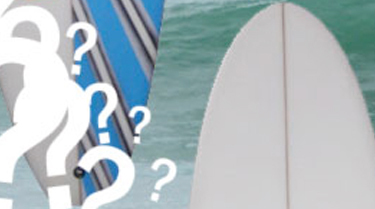 As your surfing progresses, you may wish to think about changing fins which will affect your surfing experience. With glass-ons, what you have is on the board is the only style of fin you will try as there is no point in removing them and having new fins fitted (a very difficult and expensive process). Removable fin systems are the standard choice for most boards in production now. The ease of use and versatility gained from using removable fin systems outweigh the performance advantages of fixed fins. Versatility and great to travel with – An obvious advantage of removable fin systems is the fact you can easily remove and change fins. This is particularly useful for matching styles of fin to wave conditions (for example, you may wish to have a bigger fin for more powerful, larger waves). It also means the board will be better to travel with, being easier to pack and protect without fins attached. If a fin becomes damaged, but the box/plug does not, you can easily swap the damaged fin for a new one. Some types of removable fin systems are easier and therefore less expensive to repair than fixed fins. Some systems are difficult/expensive to repair – If you damage an FCS II or Futures box for example, it is a difficult and potentially expensive job to replace. Some fins cannot be bought separately – Some newer types of fin are not available to buy separately. A top end FCS II or Futures thruster set is roughly £75 so this could become expensive if you damage a lot of fins. These types of fin system are installed in to the board after the board has been laminated. They have been the industry standard system for a while and are the easiest removable fin system to install and repair – therefore a great option for traveling with. FCS X-2 fin plugs are used in conjunction with the two tabbed fins, which most surfers will be familiar with. One plug accepts one fin tab and so two plugs are used for each fin. The plugs are set in to the board with a column of resin attaching the underside of the board to the deck for strength (it is for this reason that you may find circles or stickers over circles on the deck of your board – this is completely normal and nothing to worry about). The rail plugs have slight cant built in to them and full cant adjustment will be done when setting the plugs. This means the fins have no cant built in to them and so many will be interchangeable (depending on template). GAS fin plugs work in the same way as FCS X-2 fin plugs, but have a slightly different mould pattern so the plug looks slightly different underneath (not from the top). This doesn’t affect the performance of the system and they will accept the same fins as the FCS plugs. Most longboards and some smaller boards use a longboard fin box, which allows a large centre fin to be used. On some traditional single-fin longboards, a 10″ fin can be used. This would be too big to use with any other system, as the force applied to the fin during a turn would potentially damage the box or plug. The base of the fin slots in to the box with a small pin on the back of the fin sliding along a runner. The front of the fin is screwed down in to a plate that also slides along the runner. These types of fin system are installed in to the shaped surfboard blank before the board has been laminated. They are then glassed over and sanded away in the final stage to expose the slots for the fins to fin in. The majority of the plug being under the fibreglass gives the systems high level of strength. FCS fusion fin plugs are used in conjunction with the two tabbed fins, which most surfers will be familiar with. Each plug is a figure eight shape with slots for the two tabs on the fins built in. The fins have slight fore and aft movement when in the box for fine tuning and adjustment. The fin cant is built in to the boxes (you have the option of 0°, 5° and 9°). Adjustments can be made as the boxes are being set (the 9° boxes are used for boards with deep concaves and the 5° for flatter boards). The fusion plugs are a good system to travel with or if you have built up a collection of two tab fins, as other systems do not accept the two tab FCS fins. Futures fin boxes the up-and-coming system on the market and are a great, strong surfboard fin system. The full base of the fins fit in to the box and is secured with a grub screw from the front. Having the full base of the fin secured in the box means the fins will have lots of drive and a strong positive feel is achieved (similar to fixed fins). No other type of fin can be used with this system, however Futures have a full range of fins in many construction methods. The cant is built in to the fins, allowing many types of fins to be used without the boxes affecting the individual fin cant. Lockbox are not found in many boards nowadays, however are one of the first pre-glass fin systems and are a good system. The only downside is the lack of availability and choice of fins. The fins are secured with a screw and a plate that sits in to a recess on the side of the fin and have quite a lot of fore and aft movement when in the box for adjustment and fine tuning. Two-tab fins can be used in Lockbox boxes with the use of the Grip-it. FCS II surfboard fin plugs have not long been in production. They allow the use of standard two tab fins and a new “click-in” fin system. The click in system is a screw-less operation and uses a ball bearing on a pivot in the plug that fits in to a recess on the fin. The front of the fin slots in to the plug and then the rear is pushed down and “clicks in to place”. This system allows very quick changing of fins and a strong, secure fit is achieved. With a tab infill kit, standard two-tab fins can be used and so this makes the system useful for traveling as you are more likely to be able to replace a damaged two-tab fin than an FCS II fin.